Racing alongside his father Charlie (55), Bert came into the sport in the early 1970s, carrying the number 28 cautiously around the tracks. His measured rise through the grades heralded Charlie’s retirement at the end of 1973 and with it, the transfer of the famous number 55 to Bert. Sadly, Charlie wasn’t to see Bert’s rise to the very top of the sport, following his untimely death following year. An understandably half-hearted season followed and it was 1976 when Bert returned with firm resolve, in his famous Tarmac-liveried car. 1977 was his breakthrough year, with a handful of finals and a first red roof, followed up by an even better 1978, with a move to Superstar. After a relatively fallow period, the acquisition of a Clive Lintern machine in 1982 saw Bert once again a member of the flashing lights brigade and the following year, with a huge and sustained effort, he rose to the top of the points chart for his first major title. In the years that followed, Bert reined back his involvement, restricting his appearances to concentrate on the major titles, yet he still managed a second placed points finish (in 1985) and third place finish (in 1987, when the points list was based on meeting average). 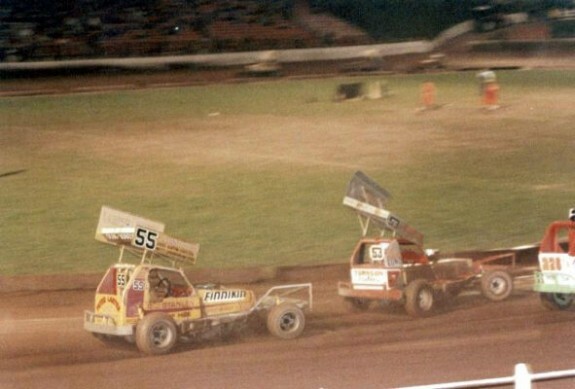 Two third place finishes were all Bert had to show in World Finals throughout his otherwise outstanding career, but he put that right in 1990 with a storming drive to win the Title at Bradford. He almost repeated the feat the following year, leading with half a lap to go, before the Peter Falding bumper took him into the fence and handed the win to John Lund. Now still tearing up the tracks in his evocative F2 machinery, the man from Leek retired from the big league as long ago as 1994, as one of the elite few to have won 100 finals.